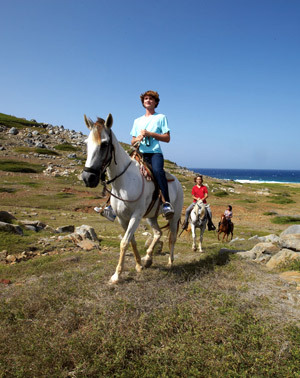 Whether it’s sailing our crystal blue seas, exploring our “cunucu” countryside, or taking the kids to The Butterfly Farm, Aruba offers something for everyone, for just about every pace and age. 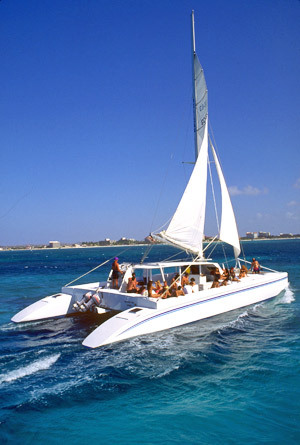 Those that like high-energy sports infused into their vacation can pursue beach and water sports like windsurfing and kiting at our famous Fisherman’s Huts; join in a game of beach volleyball on our powdery white beaches; or participate in one of the fastest growing sports in the world, beach tennis—first introduced to the Caribbean right here in Aruba. Wave runners, banana boats and parasailing opportunities abound along Palm Beach and Eagle Beach, and exciting sport fishing charters leave daily from our marinas. Vacationers that like their activities a bit more mellow and tranquil can enjoy snorkeling along our coast and reefs teeming with colorful coral and sea life. Divers can explore numerous wrecks, including the Antilla—one of the largest shipwrecks in the Caribbean. Vacationers can discover the beauty of our coastline without even getting wet on one of the many catamaran sunset sails, glass bottom boats, or even journey under the sea on a real submarine! Go beyond the beach and explore the dramatic beauty of our “cunucu” countryside. A variety of off-road excursions and guided tours can be enjoyed by mountain bike, jeep, ATV and by horseback. Hikers of all abilities will enjoy our Arikok National Park, where trails crisscross the natural habitat of our flora and fauna. Vacationers can visit our iconic landmarks like the California Lighthouse, Alto Vista Chapel, and rock formations, as well as the historic architecture of Oranjestad and San Nicolas, by jeep, bus or even on a guided Harley motorcycle tour. Golfers can challenge themselves on either a 9 or 18 hole golf courses here, and bird watching enthusiasts will delight in the hundreds of birds to be spotted at the Bubali Bird Sanctuary located in the Palm Beach area. And don’t forget to check out video clips of adventures and activities in Aruba found on the happiness builder tab on the home page.